Lisa Higgins and her daughter Kelly Slade give credence to the adage: "When life give yous a lemon, make lemonade." Higgins was working as an experienced financial director in Bridgewater when she was diagnosed with breast cancer a couple of years ago. However, it's not exactly lemonade she and her daughter are making now. 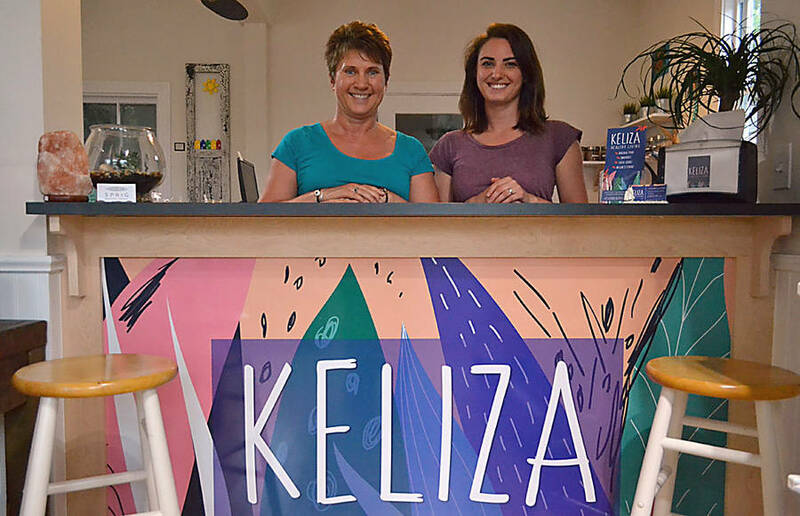 Rather, as the owners of the new Keliza Healthy Living store in Mahone Bay, the health-conscious duo are preparing super-food smoothies - as well as retailing a variety of vitamin supplements, health foods and environmentally-friendly products. And the business is chalking up some sweet success, according to Higgins. "Everybody that knows about it and comes in, they absolutely love it," Higgins told LighthouseNOW in an interview. After completing a year or so of cancer treatment and recovery, Higgins had begun to take stock of her life. And Slade, who had been working in a spa in Calgary for the previous eight years, decided to return home to Nova Scotia to be with her mother. "You know, you kind of take a different look at life. And I wasn't sure if I wanted to sit at a desk for the next 20-some years of my life, and doing finance all the time," says Higgins. The two began discussing the possibility of having a wellness centre with some practitioners. While in Calgary, Slade had initiated training in reflexology, adding to her training in reiki, and was interested in putting them to work. And Higgins saw a niche to be filled in health supplements after she found herself travelling regularly to Halifax for the protein powder and other supplements that had been recommended for her recovery, which she regularly prepared in smoothies. When retail space opened up in the Old Station in Mahone Bay after Plovers closed down, Higgins started exploring that as a place of business. As well as an ideal spot for selling supplements and other health foods, she thought it would perfect for a super-food smoothie bar. 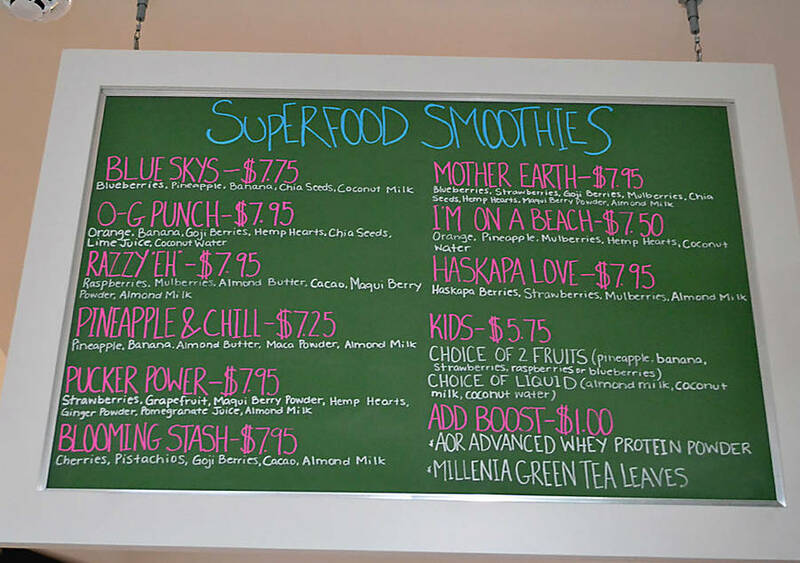 Super-foods are considered high in anti-oxidants and other healthful components. Slade, whom by then was working full time as a cafe waitress, admits initially she wasn't keen on the idea of a kitchen component and retail end to the business. But she soon came around. A good friend of hers in Calgary was a vegetarian who then became a vegan and eventually a raw vegan. It dawned on Slade that, through her friend, and from working in customer service and ordering products at the spa, she had developed a "passion" and knowledge about healthy living options. "We had really great training. It wasn't only product knowledge. I learned a lot about the skin, how the skin works, how the body works," says Slade of her job at the spa. "It was, like, 'Oh, I really do know more than I thought I did.'" "Her knowledge and training in Calgary is definitely lending itself to this business as well," she said. In any case, renting space in the former Plovers site didn't work out and they ultimately ended up in the former shop of Buchanan's House of Music on Aberdeen Lane, "which was a better fit," according to Higgins. The 1,100 sq. ft. site offers the business retail, kitchen and administration space as well as four rooms upstairs for wellness practitioners and their clients. They got the keys on March 15, 2018 and immediately got to work painting, decorating and renovating, doing the majority of the work themselves. The aim was to open at the end of April, although this got delayed slightly since both were still holding full-time jobs. Slade finally left hers at the end of April. Higgins said the original intention for herself was to carry on with her job. "I was going to try to do both. But I was quickly learning that wasn't going to happen. I couldn't give my 100 per cent to either spot." So she too ended up giving her notice, leaving behind a pension and benefits, "and just taking a leap of faith that it's going to work out." 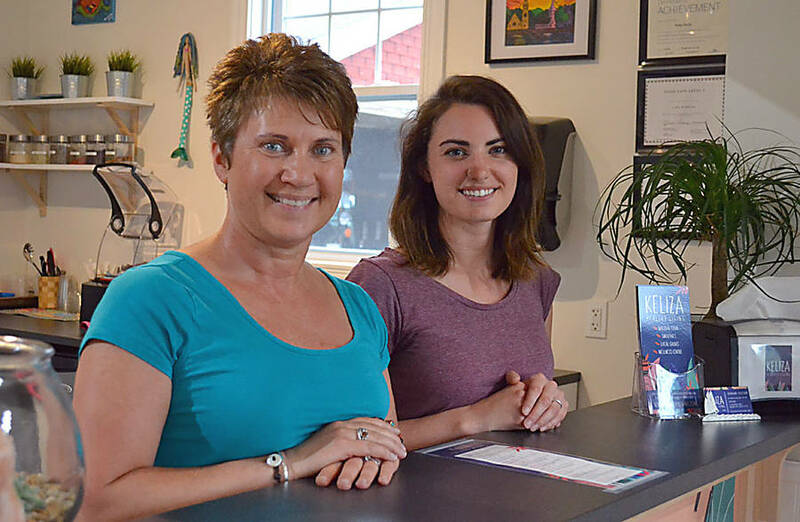 With the renovations completed, the mother-daughter team has been concentrating on stocking the store and renting out the wellness rooms upstairs. The main supplements they carry are AOR (Advanced Orthomolecular Research), a professional line produced in Calgary. They intend to specialize in local or Canadian-made products, including gluten-free and vegan snacks, and a range of organic and health foods, including organic meats, milk and cream. They currently sell organic chickens from Out To Pasture farm, for example, as well as organic mushrooms from Komatiq. 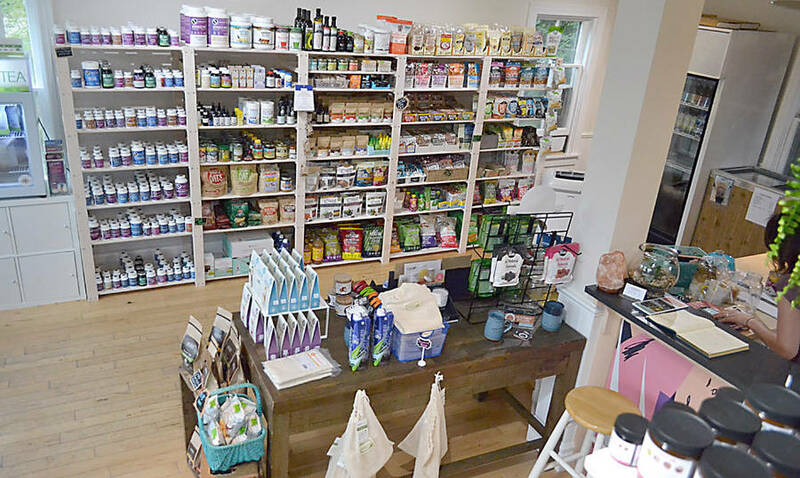 Customers will find Stellaria herbal teas from Halifax, Amanda Rhyno's Nourished line of magnesium products, Lunenburg's Mighty Oak skin care products, Pacifica natural make-up, Atlantick tick repellent, beeswax wraps, cotton vegetable bags and essential oils. "So we're just kind of a little bit of everything," says Higgins. And they continue to research new products, how and where they're made and what the values are of the company's producing them. 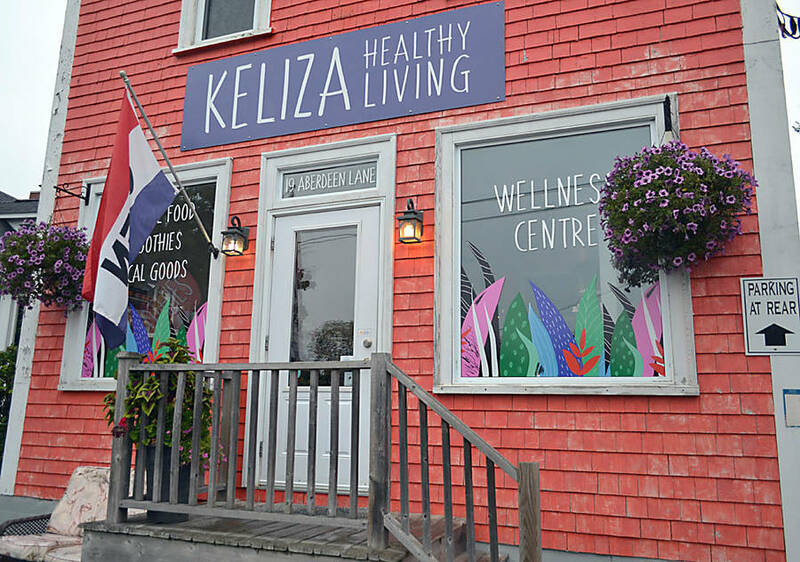 They've already began to secure wellness practitioners for upstairs, such as the clinical herbal therapist, Benna Keoghoe of Halifax. Tara Arnold, who recently moved to the area from New Brunswick, is providing services as a natural therapist and intuitive reader who also does intuitive channelling. And as Slade begins winding up her reflexology training she will soon be offering that and reiki as well. The plan is to make the clinic space available on a commission-basis to new practitioners who may not have yet built up a flow of clientele to cover monthly rent there. According to Higgins, they have about $43,000 in bank and personal credit invested in the business. "It wasn't much that we had to work with. So it's still kind of scary especially at these early stages," she admits. However, having faced some of life's bigger issues, she's not getting weighed down by the smaller details, like the fact they're still developing the know-how and ingredients for their proverbial lemonade stand. "We're just like, 'Well we know some things. And we'll just kind of learn as we go along.,'" says Higgins. And as someone who has been in the accounting trade for more than 20 years, Higgins is confident she has a good grounding on keeping the bottom line of their new company healthy.